The NCBCP, Black Women's Roundtable, andBlack Youth Vote!, stand in solidarity with our civil rights and social justice organization leaders urging President Obama to take immediate action to fix our country’s immigration system. National Coalition on Black Civic Participation president and CEO, Melanie L. Campbell, was selected as a finalist for an Excellence in Advocacy Award in the Campaign for Women Serving Women category, organizers of the Professional Women in Advocacy Conference announced recently. he intergenerational team at the eighth biennial National Coalition on Black Civic Participation (NCBCP) Ronald Walters Election Day National Command Center (NCBCP RWCC) communicated with on-the-ground field operations in twelve states to monitor problems at the polls, disseminate important information via social media, and analyze voter turnout and election results. 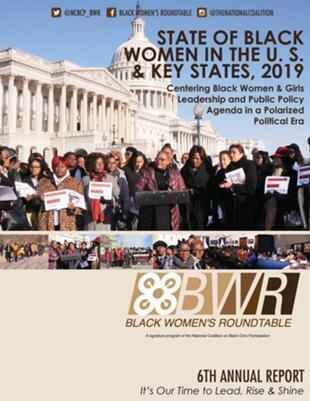 Following are comments from members of the Black Women’s Roundtable who played a significant role in voter education, protection and mobilization in the 2014 Midterm Election cycle. Their comments are based on anecdotal information compiled while manning theNCBCP's Ronald Walters Election Day Command Center which monitored and analyzed voter mobilization and assistance operations in several states. Expressing absolute agreement with National Football League (NFL) Commissioner Roger Goodell that he “got it wrong,” the Black Women’s Roundtable (BWR) held a press conference today to urge the commissioner to take swift action to “get it right,” starting by appointing black women experts in domestic violence and sexual assault to the recently established Domestic Violence Advisory Board. Open letter to NFL Commissioner Roger Goodell to express concern and outrage about the plethora of domestic violence cases that has been exposed involving current and past players and the advisory group of women recently established to assist in developing new policies related to domestic violence. The 17th Annual Spirit of Democracy Awards are presented to individuals and organizations who have demonstrated a consistent commitment to creating balance in the democratic process and support the NCBCP's mission and vision of making civic participation a cultural responsibility and tradition. From dangerous Stand Your Ground laws to voter suppression schemes, the state of Florida is known for a host of issues that negatively impact the quality of life for citizens in communities of color. 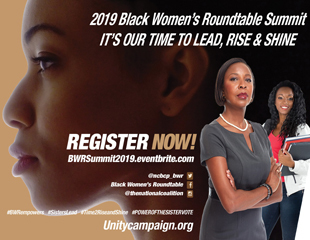 Actress, producer and activist, Janet Hubert, will talk about the importance of voting to combat unjust laws and the overall need to stay healthy, wealthy and wise during the Florida Black Women’s Roundtable (BWR) Don’t Count Us Out Tour. The high costs of prison and jail inmate phone calls places the heaviest burden of staying connected to loved ones on those who can least afford to pay--the economically disadvantaged. This forces them to make the agonizing choice between continuing communications with their incarcerated loved ones or paying for food and other essential living expenses. Power Check is a national campaign to remind voters to verify their power by checking their voting status. Currently reading page 6 of 15.